The research area in the Mason County Clerk's office is limited to available counter space, and only two researchers are allowed at one time. Time limits may be imposed if there are additional people waiting, as well. Office hours are weekdays from 9:00AM till 5:00PM, and those interested in utilizing the research area are advised to call ahead to ensure space is available. All records for the county are available from 1867 to the present, and birth records more recent than 100 years old are the only ones not part of the public record. Certified copies of records are available by mail as long as the appropriate forms are sent in along with the associated fees of $7 for the first copy of a record, and $3 for extra copies of the same one. 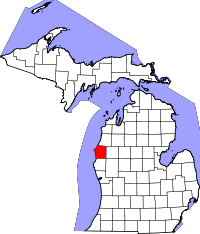 The Mason County Clerk is located in the town of Ludington, MI., which is the county seat.